Artisan-style pizzas and baked goods, along with farmers market-inspired fare, from Josh Loeb and Zoe Nathan. 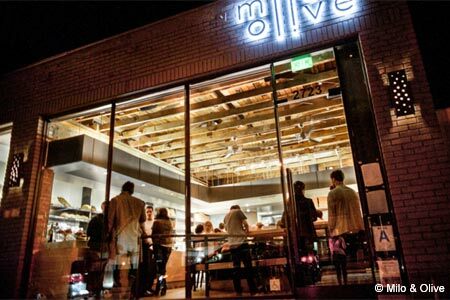 : Pizza is queen at Milo & Olive, Josh Loeb and Zoe Nathan’s Santa Monica restaurant (they are also the owners of Rustic Canyon Wine Bar & Seasonal Kitchen, Huckleberry Café & Bakery and Sweet Rose Creamery). Count on Nathan to apply her house-made style that we’ve gotten used to with her gourmet baked goods and breads to create the artisan-style pizzas. You will most definitely find a pie to your liking out of the eight versions offered. There are a few for vegetarians, like the roasted potato, mixed mushrooms or the margherita. Meat lovers: don’t miss the house-made pork belly sausage topping. Pizzas are baked to-order and it takes twenty minutes before they arrive at your table, so start with the free-range chicken meatballs. Breakfast is served daily, so it’s a good excuse to indulge in the croissants, brioches and pains au chocolat baked on the premises. All is available to take home, at any time of the day, including the breads. The place is small --- only twenty-five seats along a bar in front of the open kitchen and two communal tables --- so no reservations are taken. A wait is inevitable but it’s worth it, and the décor, with its wood beamed ceiling, bricks and cement walls, is welcoming, so it’s not that bad after all. Coffee is from Luxxe, and the boutique wine and beer list is short and select.